PAM: Hi everyone. I’m Pam Laricchia from livingjoyfully.ca, and today I’m here with Sylvia Woodman. Hi Sylvia! SYLVIA: Okay, so, my husband Jim and I have been married for 17 years—it’ll be 18 years in September. And we have two children: Gabriella who is 13 and a half, and Harry who is 11 and a half. And they have never gone to school. We first found out about homeschooling—I had gone through 12 years of public school and I had gone to four years of college and then I was working. And I had a bit of what I like to think of as a one-third-of-a-life crisis. Not a mid-life crisis, because I had it in my 20’s, so I hope that’s not a mid-life crisis. But basically, I really started to feel like, “What am I doing, and is this how I want to spend my life?” And for many years, I never really seriously thought about getting married or having a family. But in my late 20’s, my feelings about that shifted. And so, what happened was, I left my career in the private sector, and Jim and I got married, and I moved from the New York City area to central New Jersey, where we live now. And I got a job working for a non-profit where I was the only paid staff member and there were a lot of volunteers. I met so many fascinating people doing that. And one of the volunteers handed me, with very little explanation, a copy of Grace Llewelyn’s Teenage Liberation Handbook. It was just sort of like, “Sylvia, I really think you should read this book. I think you would like it.” And I did, and it kind of changed the trajectory of our lives. SYLVIA: Because we didn’t yet have kids. We were thinking about having kids, but I wasn’t pregnant yet; we hadn’t started that process yet. But I read the book and it really resonated with me about my own schooled experiences. And one of the things that has been so great about unschooling is really being able to help my kids understand that this is their real life. There is no waiting. This is it now. And this is my real life now. And I don’t have to wait. I don’t have to postpone things until the kids get older, until Jim retires. We can do it all now. And that has been huge for us. PAM: Be yourself, right? Don’t wait! So that’s how you discovered unschooling? Oh, and then I guess I should also say that after the kids were born, I started attending La Leche League meetings, and that’s when I got introduced to the concept of attachment parenting. And that spoke so directly to my heart. And really, by extension, it also spoke to Jim’s heart too. Like, we used to take—I mean, and we still do—we would go on vacation a lot of times in September, which, in this part of the country, is when there is really nice weather. But it is also after the school year begins, so a lot of families cannot vacation then, because the kids have to go to school. I remember being sort of caught off guard when Gabriella was four and we were talking about how we had been away in September, and somebody said to us, “Oh, well you won’t be able to do that next year.” And I remember thinking for a minute, “What is she talking about? What do you mean we can’t do this next year? What does she know that I …” And then I realized, “Ohhhh, she means because she thinks Gabriella will be in school!” Because at that point we hadn’t revealed that we had plans to not send our child to school. But I was so caught off-guard by that. I was like, “Oh. Oh, okay. Yes, right. I understand now.” And that was when we had to start telling people that actually, no, Gabriella wasn’t going to go to kindergarten. And dealing with all the questions that came with that. PAM: Oh, that’s so interesting. So it really just kind of flowed into your lives. You guys had come across it, you’d already knew—well, you said she was four at that time. PAM: And you guys already knew that she wasn’t going to school. That’s so cool. SYLVIA: And she was also a kid who was very wary of new situations—really didn’t like to do things without us. She really liked to know where we were. So, I really think that going to either preschool or kindergarten would have been hard on her. And we were fortunate enough that we didn’t have to make her do it. We were fortunate enough that we didn’t need school as day care. And that we had arranged our lives in such a way that we weren’t just marking time until I could go back to work. We had the ability to do this for her. And we didn’t set out saying our kids will never ever go to school. We still, every year, even sometimes several times a year, things happen and we check in with our kids. PAM: Yeah, that’s so true. Even the physical environment, right? PAM: Versus all the other stuff. So that’s great that you noticed that it kind of reinforced your choice, right? SYLVIA: And her choice too. PAM: From what she noticed—yeah, yeah. SYLVIA: Although, there might be some kids who do. And there are also some kids who are very eager to go to school. I know that that’s definitely the case. But our kids were not, and they seemed very happy to be at home and to stay at home. And I’m very thankful that they are still happy to be at home. PAM: That’s very cool. So, I wanted to dive into—okay so now Gabriella hits school age, right? One of the kind of cornerstones of deschooling for a lot of people is learning how to create an environment in your home and within your family in which natural learning flourishes. And certainly for a lot of people who come from the conventional school mindset, that is a process—and a process that can take a while. It’s not like, “Oh, we’re going to do this instead.” I was hoping you might share an idea or something that you did that you found really helpful along the way. SYLVIA: Well, a couple of things happened. We were all at home and gliding along and doing our thing and having a good time, and trying new things and going new places, and just living our life. Also watching TV, and reading stories. You know, doing the normal stuff. And I was involved in La Leche League at that point—I was a La Leche League leader, I was helping out with my group. And my co-leaders were all also homeschooling, with varying degrees—from people who were doing something that was pretty structured, to people who were pretty loosey-goosey about things. And I remember just around the time that Gabriella turned five, and a lot of my other La Leche League mom friends who also had kids around that age were unboxing these gorgeous looking curriculums they had purchased. This one had a STEM focus, and this one is going to be focusing on a Waldorf spin. And part of me—I love school supplies, I love the beginning of school, I love that sort of feeling of a fresh start with things. And I, for one moment, had a moment of, “Oh my god. What am I doing? Wait. We don’t have a box.” And then I kind of took some deep breaths and I was like, “No, no, no, no. Okay.” And one of the other girls came up to Gabriella and said, “We’re going to be learning physics and Mandarin Chinese.” And Gabriella said to her, “And we’re going to go to the new playground!” And I realized, I bet everybody would really rather go to the new playground than learn Mandarin Chinese. (laughs) You know, when they’re five. And then I realized, “Okay, yeah. We’re okay.” Going to the new playground is okay. And she might learn—Gabriella might decide to learn Mandarin Chinese someday. And it turns out that just through the process of living her life and building things and exploring things, she’s learned a fair amount of physics along the way. But I didn’t need to have a boxed curriculum for that to happen. And in the beginning, that was something that I worried about. Because until any stage happens, it’s hard to envision how you get there. Like when your kids are still in diapers, it’s hard to imagine a time when you won’t need to carry a diaper bag and a change of clothes with you everywhere you go. It’s hard to see how one day your kid just stops wearing diapers. You know what I mean? And one day your kid was not a reader, and then some day in the future your kid is a reader. Until it happens, it’s hard to imagine what that looks like. It’s like a country you haven’t visited yet. PAM: That’s a great point. Yeah, yeah. Because until you see it, like you said, see it happen in front of you, there’s still always the questions in your mind, right? What if, what if, what if. Yeah. And another thing that really has helped me in terms of deschooling is being flexible. Understanding that not every kid is going to do everything at the same age. Not every kid is going to do everything in the same order. Something that I was not expecting that happened was that Harry, who is 11 now, learned to read before Gabriella did. Gabriella really didn’t start reading fluently, until she was around 12. And Harry was really reading at like 8 or 9. And it happened gradually, and there was a long period of time where they could read some, and they could work their way through things. They could pass, kind of thing. But in terms of really being able to pick up anything—a newspaper, any book on any topic whether they were familiar with it or not—and just open it up and read? That took much longer than I thought. Because when you’re learning in a school setting, they tailor what they offer you to read to match up with approximately where your skills and abilities are. And when you don’t have that framework, obviously some things are going to be easier for kids to read, and other things are going to be more difficult. What I also didn’t understand is that what they were able to read was not connected to what they were able to understand. They had very big vocabularies, they could understand very sophisticated content, but they weren’t necessarily going to go to a reference book to learn more. They had other resources available to them. They had podcasts, they had YouTube, they had voice-to-text if they wanted to communicate with people; they had lots of other ways to getting to the same place. PAM: Yeah, that’s one of my most favorite little tidbits, that revelation. Because my youngest, too, was older when he started reading, and it did not get in his way at all. Everybody said, “Well how are they going to learn if they can’t read?” That is just one of many ways to absorb and engage with information, right? PAM: I mean, it’s the key way at school. But outside of school there’s so many other ways. Not reading fluently reference books—that does not get in their way of living and learning at all, does it? Harry made some comment about the hyperinflation that took place in Germany between World War I and World War II, and I’m like, “Wait, how do you know about that?” He’s like, “Oh, I heard about it on a YouTube video.” He was very into those top ten videos for a very long time. And I didn’t know about them, so I had him show me some. And there’s a lot of information there, and a lot of opportunities to learn more. Once you hear about this thing, then you can find out more about it. That happened to me kind of recently. Last May there was a viral video that was going around called The History of the World, and it was a really fun sort of survey timeline kind of thing about everything that happened in world history pretty much from the Big Bang to current day. And obviously, they can’t cover everything, but it was a very nice sort of survey of things. And there was a fair amount in there about China that I didn’t know about that never got covered when I was in school, and I didn’t study it when I was in college. I found out about this fairly recent archaeological discovery called The Terra Cotta Warriors. And I had never heard of them. It was one of the emperors of China, when he died, he wanted to take his army with him. So rather than bury alive his soldiers, they made terra cotta soldiers that would stand guard in his tomb. And first of all, I thought only the Egyptians were the ones who had tombs with all their stuff in it. So that was a new idea to me. And second of all, I had never heard about these Terra Cotta Warriors. And then I find out that some of them are on tour, traveling around the country, and that they had been on display in New York, and I had missed that. But, they were coming to Philadelphia, which was only about 45 minutes from us. So, we made plans to go see that. So that was a brand new thing that I found out about, because my kid showed me a video. And when I said something about the Terra Cotta Warriors, I made a mistake and I called them the “Soldiers,” and Gabriella was like, “No, no, they’re the Terra Cotta Warriors.” And I’m like, “How do you know?” And she’s like, “Oh I saw a video where they were excavating them.” And I’m like, “Really? ?” And she’s like, “Yeah! There’s archaeological videos and I watch those sometimes.” And I was like, “Wow.” So, she knew all about this long before I found out about it. So that kind of turns on the head the idea that mom is the teacher and the kids are the students. Because that has not really been our experience either. It’s really been—we’re all learning together. The kids are introducing things to us, and we’re introducing cool things to them. And it’s more like a sharing between peers, than me thinking like, “Okay, here’s our list of subjects that must be covered and I must check these boxes and make sure that there are no gaps.” And it’s really done amazing things for our relationship. “Do you want me to tie your shoe or do you want to do it yourself?” “Self! Self!” “Okay, alright.” So that’s very much been a part of her personality. Sometimes I say, “Even if I hadn’t planned to homeschool, we might have ended up homeschooling, because Gabriella wouldn’t do well in a classroom situation.” She doesn’t want to hear it from the teacher. She’s not going to take the teacher’s word for it. She’s going to check for herself. Which has also proven to be super helpful in this internet age of, “Is this a good news site? Is this a reliable source?” That’s serving her really well right now; that she’s not going to take your word for it, she’s going to do her own research and double check and make sure. PAM: I love that. And I love how you describe how learning just weaves between your days, right? PAM: Between all of you. One of the things that can trip us up when we come to unschooling and the idea of not following curriculum and following our children’s interests is—we can often think of it, “Okay, well I’m not supposed to be directing them. I’m not going to be telling them what they should be learning. So, we’re going to be ‘child-led’,” I guess is the phrase that’s often used. But when you think of it that way, that can get in the way of understanding what unschooling looks like, too, can’t it? SYLVIA: Yeah. My focus is having fun. I figure, if I’m having fun and the kids are having fun and they’re happy and they’re engaged and they’re comfortable, then the learning happens seamlessly and as a total side effect. So often people discuss school as the child’s work, just like, “Mommy and daddy go to their jobs and you go to your job, which is school,” and then, “School work is hard and it requires effort and diligence and discipline.” And we’re not finding that to be our experience. My son Harry loves video games. If we had to describe what we were doing with curriculum, his curriculum is video games. For many months he was very absorbed in the world of Fallout 4, which is one of these post-nuclear apocalypse terrains. And there are missions, but there’s also a sandbox kind of feature where you can kind of do your own thing. But the story line is sort of like, “What if World War II had gone the other way? What if we were the ones that had gotten the nuclear bomb and things had fallen apart?” And people are scavenging, and there’s radiation. But also, what if time had sort of stopped then? So, one of—and this is like a kind of very minor detail of the game—is that there is a radio station and you can turn the station and there’s different music. And most of the music is from the 30’s and the 40’s. And my son became really enamored with big band music. And his favorite song on the playlist was ‘Anything Goes.’ So naturally, I said to him, “Oh! Do you know that that’s actually a musical?” And then we were driving around town, and it turns out that one of the local high schools—that was their spring play. So, then I said, “Oh! Do you want to go see Anything Goes?” And then it turns out that one of his friends from karate is playing in the pit band. Oh! Okay. So, we got tickets, and we went. PAM: I know. I love that. It’s just a great example of all the fun and interesting twists and turns that can happen, right? PAM: When you’re just following the connections, following things. It’s being open to when these things come up, too, right? SYLVIA: Exactly. Being open, being flexible, being willing to make plans or change plans, or adjust plans. Like I was totally okay with going and only staying until the intermission. But it turns out they wanted to stay for the whole thing. That was like a bonus. That was great! Because then they got exposed to everything that happened in the second act, which led to conversations about everything from cruise ships to the kind of clothes the people were wearing. I mean like all kinds of things. So we just never know where we’re going to end up. But we’re open to it. PAM: Yeah. And you know, if you had been thinking of your lives or unschooling as ‘child-led,’ and you didn’t want to be seen as directing things, you may not have even mentioned to him, “Hey, that’s a musical,” and started pointing that out. And, “Hey, it’s here.” And you would not have gone on that whole wonderful, fun tangent. SYLVIA: Exactly! We have pictures and we have fun memories and so many things. And that also was something important for me to learn. I personally am a very extroverted kind of outgoing person, and my kids and my husband and pretty much all of my extended family are more introverted than I am. They’re happy at home. They’re happy on their own. I have a hard time understanding and relating to this. So I had to make some big adjustments in my own expectations of my own ‘what it was going to look like.’ Because my kids really need periods of busy-ness, and then times to decompress. And then periods of busy-ness, and then time to decompress. Like yesterday, we had a really busy day. We went to homeschool ice skating, and then we had friends over, and then Gabriella and I went shopping, and Harry and Jim are involved in taekwondo, so they were at taekwondo for a couple of hours. And so, I imagine that today is going to be a lot of hanging around the house, playing video games, watching things on YouTube or Netflix. And Gabriella draws every day, so she’ll probably be doing some stuff with her art. You know what I mean? So today is going to be more of a down day. Then I know we have things going on this weekend, so we’ll be ramping up and being out and about again. And then probably the following week, quieter. I think that would also be hard for them if they were in school and had to go every single day and be with people every single day, when what they really need is to be home and to be quiet some days. PAM: Yeah. That time just to regroup—it’s totally individual. So much happens in there, right? SYLVIA: Right. And what a gift to be able to provide that for them. PAM: And to know each other so well, to know that we have these patterns, for lack of a better word I guess. SYLVIA: Right! Right. And to be able to know that about yourself at 11 and 13. You know, I’m still figuring this out and I’m in my 40’s. You know what I mean? Moving to unschooling can also be a catalyst for healing from our own childhood, right? PAM: I didn’t start understanding myself—and I didn’t even know I didn’t. PAM: You know what I mean? Because I was just doing what was expected. And I thought that was my choice. PAM: Because it was either do it and quote “do well,” or don’t do it and get in trouble. So, of course I’m going to choose—well, of course, for me, that was my choice, right? PAM: But through unschooling, I learned so much more about myself. And it really has been a healing time for me. Have you found that too? SYLVIA: Yes. It’s been healing—it’s also been sort of liberating in a lot of ways. SYLVIA: Like, a lot of things that were sort of weighing me down. Like one of the things that has really been so helpful for me, is to let go of ideas about healthy food and junk food. The idea that it’s all food. All of it. Even Twinkies, you know what I mean? It’s all food, and it’s not useful for me to start categorizing it into “this is a good food” and “this is a bad food.” Because that was very much a thing that was sort of threaded through my childhood. I came from a family where we were doing the best we could with food. Like I remember as a child, we never had butter in the house, because butter was considered to be unhealthy. But margarine was fine. But now, as an adult, it seems that things have reversed, and that margarine is maybe not so good for you because it’s saturated fat. And like the way that people thought about eggs. We never had eggs, because eggs were bad for you. They were bad for your cholesterol. But Fruit Loops were okay. Wait a minute! So yeah, so there was a lot of confusing messages about food. So now it’s fine. Now I feel like I’m developing a better relationship around food, and I think my kids are too. My kids can definitely take or leave candy. I mean, they like candy, but like when I was a kid, Halloween candy—like that stuff, you would eat it even if it was something that you didn’t like. Even if it was something that would make you sick. Because that was your Halloween candy and it was limited and you wouldn’t get it again for a whole other year. And now that as an adult my relationship with time is different, so a year is not very long. But when you’re a child, a year is a really long time. And my kids understand that there’s always candy in our house. And it’s never something that, “Oh my god this is the last one and we’ll never see it again.” They don’t have that kind of feast or famine relationship, really with any food at all. And they don’t even know about how that could weigh them down. Like that’s a lightness that they have about them that they don’t even know they have. Do you know what I mean? PAM: Yeah, I know. It’s a good point. SYLVIA: I can see that they can be completely relaxed about candy or any kind of food really, and sometimes I feel like, “Oh, well I have to eat that, because it’s on my plate.” Even if I’m no longer hungry, I feel like I have to finish it, because it’s there. And they don’t have that baggage, and that’s a wonderful thing. And I also would like to say about food and stuff: unschooling doesn’t prevent normal kid stuff. My son Harry was very selective about what he would eat for a long time. For a long time, there were only a few things that he would reliably eat all the time. And both my kids nursed for a very long time, and so I knew they were getting some nutrition that way. But in terms of other foods, he was very limited in what he would eat. And I don’t know whether he had some food allergies that maybe he later outgrew, or maybe it was a sensory thing, or textures, or smells. I don’t know. Because he was little and he couldn’t really articulate why he didn’t want to taste something. So, we let it ride for a long time. And more recently, in the last two years or so, he’s suddenly been much more open to trying new things. And a lot of the places where he got inspired to try new things was TV, video games, YouTube videos. He saw a commercial for Kentucky Fried Chicken. Now, he already knew that he liked chicken, he already knew that he liked breaded chicken. So, he decided he wanted to try Kentucky Fried Chicken. So, of course, part of me is freaking out. Fast food: is this going to be down a path to some kind of obesity disaster, or whatever. But on the other hand, I thought, “I do want him to try new things.” So, this is the thing he wants to try. I’m not going to say no. There’s a Kentucky Fried Chicken in our town, we drive over there. I wanted to go in, but the kids did not want to go in. They wanted to go through the drive-through. So, we’re going through the drive-through, and I want to order an assortment of things, so they can try the different things that they have on offer. I’m trying to figure this out, but the meals are set up in a certain way. And I want some of the things and I don’t want other things. And it’s the middle of the day, so I don’t feel too much pressure, but eventually a car is behind us. So now I feel like, “Okay, we gotta finish this up, because there’s somebody waiting.” I’m like, the pressure is on. So, yeah. So that was Kentucky Fried Chicken. And so, he tried it, and he liked some of the things and he didn’t like others of the things. And then the other thing, he was playing a video game called Team Fortress 2. And one of the ways that you get your health back, is you eat a sandwich. And so for a while, he was very interested in trying sandwiches. And he would eat any sandwich that I would put in front of him, as long as it was cut on the diagonal, and there were toothpicks in the two halves. I can do that, you know? And then the other thing also was YouTube. There’s a lot of YouTube videos where people are doing challenges where they’re trying baby food or there was a hot sauce challenge where they were trying different kinds of spicy sauce. And that got Harry into trying some other new things that he wouldn’t have tried before. One time the kids had a sleepover, and so we decided to do, as an activity for the sleepover, we did the Oreo cookie challenge. Are Oreo cookies a thing in Canada? PAM: [laughter] We do not have all that variety. SYLVIA: I went to the store and I bought like six different kinds. And then we brought them home, and we blindfolded the kids, and we put the Oreos in front of them, and we let them taste them and try to identify them from the flavor. So that was hilarious and fun. And then we had a whole long conversation about taste buds, and who tastes what, and how different people taste things differently. We talked about like how cilantro, some people find it tastes like soap and other people love it. So we had a whole conversation about that. But the good news about it is that Harry went from being the picky eater to a kid who really is open to trying new things. But he had to come to the point where he would understand for himself that trying new things can be a positive experience. That sometimes you can try new things and it’s really good. Because I think for a long time, any time he tried something new, it was not good, and it was disappointing. I don’t care if he’s a person who loves to eat 100,000 different things. I care that he’s a person who’s willing to try new things. PAM: Yeah. Yeah, no, that’s a great point. But just to be supportive of him where he is on that journey, right? PAM: It took a while, but he knew it was okay because he didn’t feel pressure from you that the way he was in the moment was bad. But you’re there to happily support him whenever you see him reaching out too, right? PAM: Not just to keep bringing him the same thing. Because it’s being open to where our kids go. SYLVIA: Or, even if it’s something that I think he won’t like. Sometimes I built on things that I already knew he liked. Like I knew he liked pancakes. So, since he liked pancakes, maybe he’d be willing to try a tortilla. I also knew he liked pizza. Maybe he’d be willing to try a quesadilla, you know, with tortillas and cheese. Oh, okay. You know what, there are these things called crepes, that you might like to try. Oh, sometimes people put Nutella (which is something he liked) in a crepe. Maybe you’d like to try that? So, building on—every cuisine has some kind of pancake, you know, or flat bread, whether pita bread or naan, or whatever. We know he likes this thing, so maybe this is not that far removed. PAM: Yeah, just helping him explore things, right? SYLVIA: Yes. And being okay if he’s like, “You know what, I’m not up to it.” Because there are days I’m not up to doing things. There are some days when it just feels like it’s too much. I don’t want to do something new. I want to stick with my routine. I know you have lots of stories around how technology has enhanced your unschooling, and you have shared great ones around musicals and food. I was wondering if there were one or two more that you might like to share? SYLVIA: When I was what I like to call a baby unschooler—when I was very new to all of this, still learning about this—I was very nervous about video games. Because you hear things, and there’s news reports, and sometimes you read an article in a magazine that talks about how dangerous video games can be. Someone gave me some very good advice: that I needed to find a video game to play myself. And so, the first video game that I ever played was Plants vs. Zombies. And it was like the number one app I think in 2009 or 2010. Looking back at it now, it feels so funny. But that was the first time that I played a video game all the way through. It was the first time I ever encountered a boss level. It was the first time I understood about mini games and the games within a game and there was the mission and then there was the side stuff. And also, what I really appreciated was—and this is so funny now—how advanced the graphics were compared to things like Pac Man and Space Invaders from when I was growing up. And so like this is like 2010 graphics as opposed to 2018 graphics. But at the time, I was like, “Wow, there’s an awful lot of detail in here!” And also, Plants vs. Zombies—there’s so many funny jokes. And there were so many references to things. For a long time, when Harry was around five, he loved Plants vs. Zombies, but his favorite aspect of it was: there’s an almanac where they list out all the zombies, and give their back stories, and all the plants, and the plants all have distinct personalities, and features and traits. And also the catch phrases. I don’t know. And you know how a little kid likes to have their favorite book read to them over and over again? He loved for me to read that almanac to him, over and over again. And we would crack up and laugh every single time. And when we finally beat the whole game, they play a song at the end. And so then we found YouTube videos of the song, and we would dance to the song around the living room, and sang all the lyrics. And then they made Halloween costumes, and Harry was a zombie and Gabriella I think was a plant, and Jim went as Crazy Dave with a pot on his head. So again, like everything, it starts small, and it gets big. It ripples out. So like yeah, Plants vs. Zombies was the pebble in the lake, but then all this other good stuff came out afterwards. Harry largely learned to read from playing Minecraft. And it was started with even just little stuff, like me spelling the word “creative” a hundred times a day, because he wanted to play in creative mode, not the adventure mode. But like, then we found out that oh, there are crafts around Minecraft that we could make. That was very interesting to Gabriella. We could make Minecraft-themed snacks. My sister-in-law, who is a very devoted cookie baker, found Minecraft cookie cutters, and got some for us. So, every year at Christmas time, along with all the traditional Christmas cookies, there are usually a few Minecraft cookies, some pickaxes, you know, other things. And that’s just now part of our extended family holiday culture, that there’ll be some Minecraft things, a few Star Wars cookies, you know, that kind of thing. You know, the different things the kids are interested in. And they show up not just when playing games. Not just when watching a movie. But they’re showing up in other places. Which, that’s so much fun. PAM: I think that’s such a great point. Two great points in there. I love the way it ripples out into the rest of our life. Because it’s part of our family’s conversations, right? And extended family’s. That’s beautiful. And your point about playing a game, or more. You know, especially when you’re worried about it. I think that is such a great thing. Because, you can think, “Oh, I’m worried about technology. Yes, people say they’re going to learn when they play these games. How do they learn?” And you can make it a whole research project and read all sorts of articles about all the things they learn when they play Minecraft, or when they play X, Y, or Z, right? But—when you play and just try to figure out—you have to learn! And all of a sudden, you know that this isn’t just some simple little mindless thing. Nothing is mindless—you eventually figure that out too. I jumped in—I got my first DS way back when they were big and clunky! The other thing that was so great about Minecraft is that eventually—like, we started out with just one laptop, and then eventually we got more computers, and we got video game consoles, and we got DS’s and hand-held devices, and all this sort of thing—was that eventually we had enough devices that I could get a Minecraft account too. SYLVIA: And one of the most powerful things about that was discovering how bad I was at it. SYLVIA: How hard it was for me to do anything in it. How it took me forever to get through the door without banging into the door frame, how it took me forever to line up the bricks and to clear the path. You know, it took me so long. And that my kids could help me. That they could be the teacher. That they were the expert. And I think it’s really cool when a seven-year-old is in that position, of showing you how to do stuff. Like that’s really—because especially for a seven-year-old who’s the littlest kid in the family, who’s the littlest kid of our peer group. You know what I mean? Who’s always the smallest, the last. And for this to be the area where he’s big, and he’s powerful, and knowledgeable, and a respected expert. Like that’s a huge thing. And that is not something that kids get on a regular basis. PAM: But that’s it. It brings your relationship to a whole other level, doesn’t it? It’s a whole new way to connect with them, where they absolutely have wonderful information to share with you and can show you how to do things. PAM: It’s amazing. And you’re just so impressed by their skill. SYLVIA: Yeah, and there’s levels within Minecraft. Like, you know, there’s just playing around building a house, whatever, but then there’s like sort of electronic circuitry, there’s stuff with redstone. You know, you can make this as complicated as you want it to be. I know Gabriella really loved building sort of these elaborate worlds in Minecraft. She built one place where everybody traveled by roller coaster everywhere. And that was amazing to me to see. When she was like, “Okay, I’m going to set it off,” and you could see all the rollercoasters going. It was a little bit like those very elaborate domino arrangements that people make, like they spend hours building them. This sort of had that feel to it. PAM: That reminds me of Rollercoaster Tycoon. Did you ever come across that game? PAM: That was a big game in our family for a few years. Whereas they enjoy the figuring out piece, right? And they will have spent that time—like they will go many, many hours before they’ll finally choose to go online and get an answer to a particular puzzle. They’ll be like, “Oh yeah, that one was hard.” You know, making me feel better, but they figured it out. I didn’t. That’s so interesting. SYLVIA: Yeah, I mean, because that addresses the concern that a lot of parents have, that if we don’t make them do something they’ll never do anything hard. That we’re preventing them from having ambition. And it really hasn’t been my experience. Gabriella has always been very artistic and has always drawn. And recently she got herself one of these computer drawing tablets. And she did the whole thing—she researched the whole thing on her own. She saved up and purchased it on her own. She set it up. I basically sat next to her and offered very minimal logistical support. I did almost none of it. Set the whole thing up and has, over time, figured out how to use it. Now, I should just say: we completely would have bought this for her. Jim and I absolutely, just the same way that if the kids were doing a curriculum, we would have bought the curriculum, we would have bought them text books, we would pay for their laptops. But she wanted to do this herself. And she was very clear that she did not want us to buy this for her for her birthday or for Christmas or for just because she needed it. We don’t even necessarily say you have to wait for those arbitrary dates. But I mean she wanted to budget for it, she wanted to save her money for it. She wanted to own the whole process. And learning to use it was frustrating. And there was a learning curve. And it was hard. There were times when she was mad and she would shut the thing off and storm off and go do something else for a while. But she always came back to it and persevered, and now she’s cranking out some amazing art. And some of it she’s sharing to post to social media and some of it is just for herself. And I can’t even describe the feeling I have when I see—to say I’m proud of her, it feels like an injustice to say that. Like I’m just, I’m in awe of her. And this also is because I do not have artistic abilities, you know what I mean? SYLVIA: My areas of creativity are elsewhere, you know? So, I’m in awe of her drawing and I have been forever, even since she was little. But yeah, so this is an example of her doing something challenging and persevering even when it was tough and not quitting. So. Yeah. PAM: Yeah. I think that’s one of the big paradigm shifts, too, is it seems to be conventionally that we feel we need to teach our children that level of dedication. We need to expect it of them, so that they learn that that’s important. But really, all we need to do is help them explore the world so they can find the things that they love so much. They are just intrinsically completely dedicated to it. They come and go, and through the frustrations, and maybe toss it for a while. Like, I know after Lissy finished one of her first long-term photography projects, she was like, “Woah! My goodness.” And she took a break for like six months. She didn’t pick up the camera. Yet, after she did, when she went back to it, she realized how much she had still learned and progressed in that time. Because she did all sorts of other things. She was still looking at pictures, she was still analyzing pictures, she was developing her eye. You know, all those things that you don’t say, “I’m going to sit down and look through this magazine and develop my eye more.” No, you’re just doing what’s interesting, right? What you’re drawn to do. And that comes naturally. SYLVIA: Yes. And I think also that period of like taking the time—when you’re on a break, or you’re taking a break—it’s not fallow time. It’s not wasted time. Because all of that information that she had was synthesizing and percolating and recombining in new ways and new connections are being made. So that when she picked up the camera again, I’m sure she had the experience that she felt like she had leveled up in some ways. PAM: No, that’s exactly it. There’s just so much value in those down times, right? Just going back to what you were saying before, you know, just in the rhythm of your days, the up and down. When you don’t get that down time to process and to let things synthesize and come together, you’re missing out on so much of the whole experience. SYLVIA: Right. Yeah, Harry had this experience with taekwondo. He started taking taekwondo when he was five and was progressing and enjoying it and whatever. But there were some areas of it that were challenging for him. Learning the forms was hard for him to remember all the way through. Also, he had reached the level where the kids were beginning to spar, and he was physically the smallest one in the school, who was at this level. And so, he was not winning his sparring matches. And it was frustrating for him. So, he was having difficulty learning the forms, and he was having difficulty with sparring, and so he got discouraged. And he decided that he wanted to stop. So, we let him. He took some time off. But we didn’t make a big production about him quitting. We just said he was taking a break. And once in a while, if we were driving and we would go past, I’d be like, “Oh, yeah, that’s the place where Harry takes taekwondo.” And you know, just whatever. And we were doing other things, and going other places, and trying out different stuff. And after about six months, Harry said, “You know, I think I’m ready to go back.” And I said, “Okay!” And so we went back over there, and the instructor was there and he was so happy to see Harry. I said, “Do I need to sign him back up?” He’s like, “Well the guy who does the books is not here, but if he wants to take the class he can come right in.” So he went right in, and he proceeded. And during that time off, those six months, I don’t know whether it was a physical maturation or a mental maturation, or he matured cognitively, or what happened. But something important happened during those six months off, because when he came back, he was definitely at a new level, and suddenly, learning the forms wasn’t as hard. He started to do better at sparring. He had more confidence in his abilities. And he went all the way through and he got his black belt. And he recruited my husband in the process, so now my husband goes, and now my husband got his black belt last year. And now they’re both in a leadership training program at the school. So at the end of—I think by the late spring, Harry’s going to be able to—you know, he’s already doing a lot of teaching for the younger students right now, but he’ll be a teacher. Which I think is kind of hilarious, that an 11-year-old who’s never been to school is now going to be an instructor at this school. But again, it’s like, the time when he was away from it, he wasn’t really away from it. SYLVIA: It wasn’t time spent where he did nothing. There was obviously so much growth, so much development, so much maturing happening during that time. And also we tried really hard to leave the door open, so that he could go back to it. That he wouldn’t feel like, “Oh, I quit and if I go back they’re going to say ‘Oh I told you so.’” Like I really don’t ever want my kids to feel like they’re in a situation where they can’t adjust their course. PAM: Right? We are always so worried about letting those down-times happen, because we don’t have proof. So that’s one of the things that comes with experience. When we say with unschooling, when people come to it, we say, “Really try to give it a year. Try to really, really be open to it and throw yourself into it for a year.” Because you need that time to be able to look back and see those cycles. To see what happens after the down time. To see the growth, the internal growth, and the knowledge that just has happened to them through those periods of intense bursts of activity, and the quieter times. To start to see those patterns. Because if you don’t give yourself that time, you’re still looking for that result, right? PAM: You’re still looking for progress. It looks so different. SYLVIA: Right, and there are some parents who are looking for their kid to come to them and say, “Okay, please teach me algebra now.” That’s probably never going to happen in my house, you know? But that doesn’t mean that my kids haven’t been exposed to algebra, that they haven’t used algebraic thinking in, whether it’s playing a game or building something, or tripling a recipe. Natural learning doesn’t look like school learning, or what passes for learning in school. But it doesn’t mean it’s not happening. And sometimes it’s also okay to do things just for fun. There doesn’t have to be a lesson behind the movie that we’re watching as a family on Saturday night. We could just be watching it because it’s a great movie. And invariably, you learn from it anyway. But like I said, that’s the side effect. That doesn’t have to be the purpose. SYLVIA: Yeah. It’s a happy side effect. And it’s been so great for our family, and it’s been so great for all of our relationships. PAM: That leads very nicely to the next question, which is just how unschooling expands so much beyond how our children learn and the things they learn. Because that’s what we’re focused on at first, because we think of unschooling as replacing school, and school’s where they go to learn, because that’s their job, right? SYLVIA: It’s all about the kids. At the beginning, it’s about the kids and it’s about how they learn and how am I going to replace school, replace curriculum, how are we going to do that differently. But eventually we discover it expands so much further than that, doesn’t it? Before I learned about unschooling, I kind of believed that if I just worked hard enough I could resolve whatever the problem was. That any problem that was happening, was on me, to just—if I worked harder, it would fix itself. SYLVIA: And that actually turns out not to be true. SYLVIA: Exactly. I will stay later. I will work harder. I will make more. I don’t know, whatever it was. And so, one of the things, just like we are encouraging the kids to do interesting things and try new things and have fun, I can be that way with Jim also. And Jim can be that way with me too. And that’s a really beautiful way to live. A really fun way to live. That we can get excited about each other’s interests. And make time and space for them. My husband Jim is a home beer brewer. He started doing this even before we met, but in the beginning he had some equipment in the basement, and he would get some kits and he would do them. And as he has gone along, he’s met more people who do this, so that’s created a whole new set of friends for him, all of whom are very interesting people. So that’s enriched all of our lives. And then he was learning how to break away from using a kit—sort of like the way a baker would break away from using a box cake mix to making a cake from scratch. So now he’s brewing beer more and more from ingredients. And then we had a friend who was growing hops in their backyard and had an extra plant, so he gave it to Jim. So now we have hops growing up the side of our house. And so at harvest time, the kids are out there, on the roof, picking—because the hops plant grows enormous. It’s as tall as our house. We have a trellis right up the side by our front door. And so the kids are on the flat roof and they’re picking hops, and we’re drying them. And then months later Jim’s brewing them. Oh, and when the kids were little, he had a little bottle capper, like to snug the cap onto the bottle, and that was a big thing when the kids had enough upper body strength that they could work it and put caps on the bottle. We have pictures of the kids at like three and four years old, in their pajamas, helping bottling the beer. So, that’s been a way. But, you know—it’s time spent together, and time that we’re talking, and learning, and doing things, and sharing experiences. There’s a lot to be said for just logging in the hours together. It’s having those shared experiences. Making those kinds of memories. Like this is what, eventually, the kids will be grown up, and when they think about their childhood, I want it to be these kinds of happy memories to be what they have to draw on in the future. PAM: Mm-hmm. Yeah, I love that. And it all starts—well, I mean I know it did for me, certainly—I got so much better at learning how to engage in a relationship with another person, just through trying to develop a strong relationship with my kids through unschooling, right? PAM: It was amazing. Now, our last question. Right now, what’s your favorite thing about your unschooling lifestyle? SYLVIA: You know, it’s so funny. I was thinking about these questions ahead of time, and I had some notes and I had some bullet points, and I had some anecdotes at hand, and I don’t have a specific answer for this last question. Because it’s hard to pick just one thing. Like, I love the flexibility. The ability that we could travel whenever we want. Like we’re not tied to the school system. I love the fact that I can play. That I am free to play just as much as my kids are free to play. I like to do a lot of cooking. I like to experiment with a lot of recipes. We like to invite a lot of people over. We can have parties. We can play games. We don’t have to do what everybody else is doing. We’re free to not only do what’s right for us but what makes us happy. And I feel like by unschooling that provides a really nice framework for that to happen. PAM: Yeah. It’s the whole lifestyle, right? SYLVIA: Yeah. And everything can lead to something else. I was reading an article in the New York Times just this past weekend. In the travel section they had an article about Spain. I went to Spain when I was 16, and I loved it. It was a wonderful, wonderful experience, and I would love to go back. And I said to Gabriella, I said, “We should totally go to Spain.” And she said, “Why?” And I said, “Because you can go out to dinner there at midnight.” Because Gabriella is very much a night owl, and as a 13-year-old is very much in that vampire opposite schedule kind of thing. And around here, most places, they might be open until 11, but most places are not open past that. And so, the idea that the night is just getting started at midnight in Barcelona, you know, we could go, they have really good bread there, they have food there. We could go try this food out. And we could do it late at night and we could sleep in in the morning and we could go to the beach in the afternoon. PAM: For the right bread. SYLVIA: Yeah, exactly. So who knows. Maybe we’ll go to Spain. PAM: Yeah, exactly. It’s just seeing how things flow, right? It’s a surprise every day, just to see what comes up. SYLVIA: Exactly. And where we’re going to be next, and what’s going to happen next. And you know, things could change. Things might change. Some day they might say, “You know what, I really want to go to school,” or, “I’ve decided I want to be an engineer, so I need to really catch up on school style math,” or something like that. And we’ll be there to help them do that. And I will be sad when they’re grown up and we’re not here all together doing all the stuff. But I’m really glad that we have this opportunity to do it now. And I’m really trying to savor it. Because things do change. Sometimes they change awfully fast. So I really want to drink up all the goodness that is right here, right now, as much as we can. Because I really think that will help sustain us later on. I want them to have these good memories. I want to have good memories. I mean, this is what I’m choosing to do with my life for this decade or decade and a half. I want it to feel like this was a good choice, this was a fun thing to do, this was a great thing to do for our family. PAM: I love that so, so much, Sylvia. And thank you very much for taking the time to speak with me today. It was so fun! SYLVIA: But yeah, no, this was a great experience. Thank you so much for giving me this opportunity. PAM: And thank you so much for sharing all your wonderful stories. That was great. And before we go, where’s the best place for people to connect with you online? 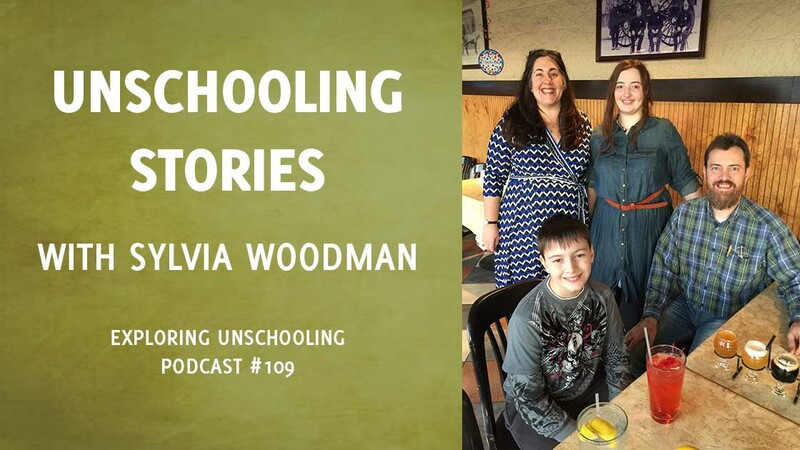 SYLVIA: I am on Facebook a lot, and I admin a group called Unschooling Q & A, which is a great place for people, particularly if they’re new to unschooling, to come. This is the place where no one is ever going to get mad at you for asking, “Well what about algebra” for the 700th time, or, “What about bedtime?” I want all those kind of beginner questions there. And I also help out Sandra Dodd with the Radical Unschooling Info group. I’m an admin over there as well. So that’s a great place to find me to talk about unschooling. PAM: Awesome. Great. And I will put the links in the show notes. Thanks again so much! Have a great day! SYLVIA: Thanks! You too. Bye now.